One easy to use resource suitable for all ages and abilities. Our aim is to deliver Hockey G.A.P.S. and coaching tips that will help players and coaches of all ages and abilities how to play Hockey by developing techniques and skills specific to the game. The original and unsurpassed software for animated Hockey Games, Activities, Practices & Skills. 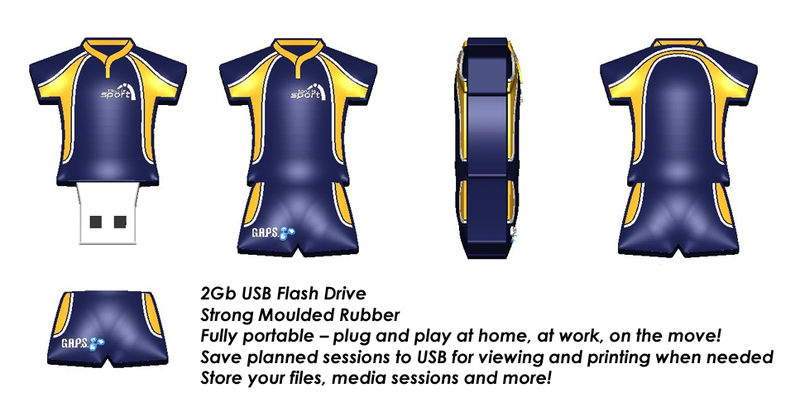 NEW – Software now available on 2Gb USB Drive. Fully portable – plug and play at home, at work, on the move! Store your files and media. G.A.P.S. Hockey contains 250 Games, Activities, Practices & Skills covering: Moving With The Ball; Passing & Receiving; Vision; Shooting; Goalkeeping; Defending; Set Plays; Unit Play; Small Team Games & Fun and Games. G.A.P.S. resources support the effective teaching and coaching of games and are based upon a ‘Learning through Games’ approach to coaching, providing Games as starting points. These are supported by a range of related Activities, with specific Practices to support key elements of successful game play (e.g. 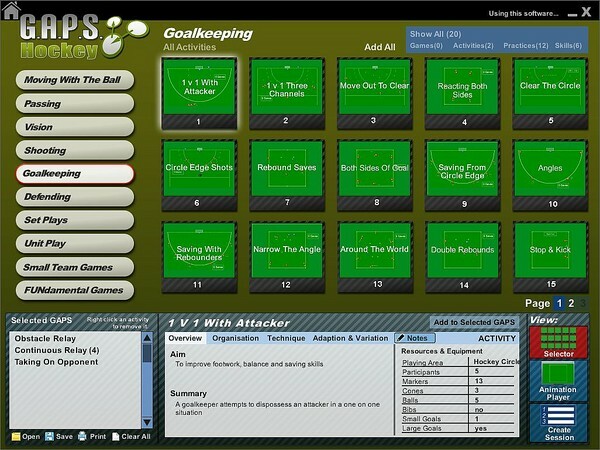 Goalkeeping), and focused Skills exercises for the development of individual technique (e.g. movement around the goal). G.A.P.S. Hockey provides teachers and coaches with 250 G.A.P.S. in animated format. The Activity Selector provides access to the content via 10 sub categories that cover the key elements of the game. Selecting one category (e.g. Shooting) will load the relevant G.A.P.S. as thumbnails in the index. A search can be narrowed by filtering the index by Games, Activities, Practices or Skills. A selected Game, Activity, Practice or Skill reveals an Information Panel. From here Overview, Organisation, Technique, Adaptation & Variation and Resources & Equipment can be viewed. Selected G.A.P.S. can be played in large format with the Interactive Animation Player which uses an innovative Slider™ to play and control the animations. You can also use the selected G.A.P.S. to create a Session. These sessions can be saved for future reference or printed. Individual G.A.P.S. with supporting text can also be printed. Practices involving forehand (open stick) and Indian Dribbling. The drag right to left and left to right, changing direction and changing speed are covered. Individual and unit play practices are used in grids and relays. Practices involving the push and hit are covered. Passing using the open and reverse stick from a stationary position and on the move are included. Receiving the ball on open and reverse stick in both stationary and moving positions, from the left, right, front, and from behind are shown. Practices involving individuals and groups in grids, relays and game-like activities are used. 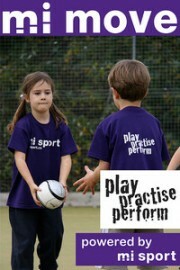 Practices involving individuals, pairs and groups of players using grids and relays for passing and scanning activities. These activities are developed into a range of small team game practices. Practices involve working in channels to produce shots at goal from the edge and within the circle. Hitting, pushing and flicking skills are used. Lay offs and deflections are also covered: some practices involve attackers being pressured by defenders. Reverse stick shooting is also illustrated. Practices finish with a shot at goal. Practices involving kicking, rebounds and saves using the glove and stick. Movement around the goal area and circle is covered together with 1 v 1. Narrowing angles and making ‘second’ save are shown together with pressure shooting practices. Practices involving open (forehand), reverse stick and jab tackles are shown: also channelling, closing down, covering and delaying. Defenders responding to losing possession and tackling under pressure and in 1 v 1 situations are covered. Playing the ball from the defence area is also shown. Practices involving penalty corners (attack and defence). Penalty strokes (attack and defence), 16 yard hits, side line hits and free hits including those around the head of the circle are covered. Practices involving 2 v 1, skills under pressure (defence and midfield), switching play in attack, creating space and movement off the ball are covered. Attacking play involving 2 v 2 and 3 v 2 in channels and passing from midfield to attackers is also shown. Games involving overloads, passing into space, extra goals and attack versus defence. Conditioned games involving restricted areas, zones and unopposed hockey are also shown. Competitive games with the emphasis on fun. A skills course is included and goalkeepers play football in the circle. 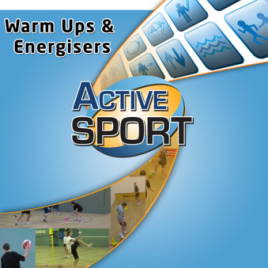 Conditioned games related to netball, cricket and ice hockey are included.